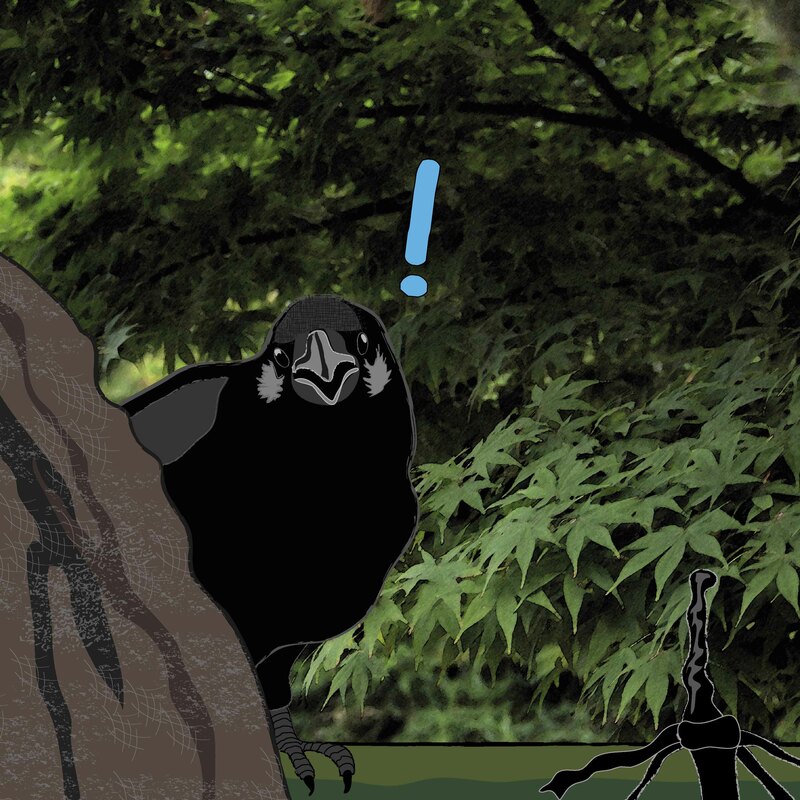 Early in the morning of the 3rd October, a Tokyo Crow came to the Bamboo Bathhouse with a report that the Ebisu statue normally in front of Ebisu station in Tokyo was missing, and that the humans, who often arranged to meet at the statue would soon notice that something was wrong. And so Boss Panda, Miko-chan and Kiku the fox travelled to Ebisu station on a green Yamanote line train, first going to see the empty granite rock where the god should have been sitting, just outside of the west exit. They began to search the surrounding area, and became aware of a loud sobbing coming from an alleyway behind some small bars and restaurants. Both Miko and Kiku looked confused. “Others?” they asked. Boss Panda knew at once what the problem was. He explained that in Shinto tradition, it is believed that during the tenth month, the 8 million gods of Japan leave their shrines and places of worship and travel to Izumo shrine in Shimane prefecture. During this time, the tenth month in that part of Japan is known as “the month when gods are present”, while the rest of Japan has ‘Kannazuki’ (神無月), or the ‘month without gods’. Miko-chan frowned and looked at Ebisu. “If all gods travel to Izumo shrine, why have you not gone with them?” she asked. The stone figure continued to cry and did not appear to have heard the question. Kiku did not like to see anyone so unhappy, and thought for a minute. He knew that Ebisu was always seen holding a fish, and this one had set his stone one down on the floor while he cried. “DO YOU LIKE FISHING?” he shouted as loud as he could. Ebisu’s eye’s began to sparkle through the tears. “I LOVE to fish! But I don’t have anyone to go with…” he trailed off and the tears began to flow again. “I LIKE TO FISH TOO”, bellowed the little fox. “AND I KNOW A PLACE WHERE WE COULD GO ONCE A WEEK TO RELIEVE YOUR BOREDOM. IT IS QUITE POPULAR AND SOME PEOPLE FISH FOR HOURS, SO I DON’T THINK YOU’D BE NOTICED”. Boss Panda laughed. 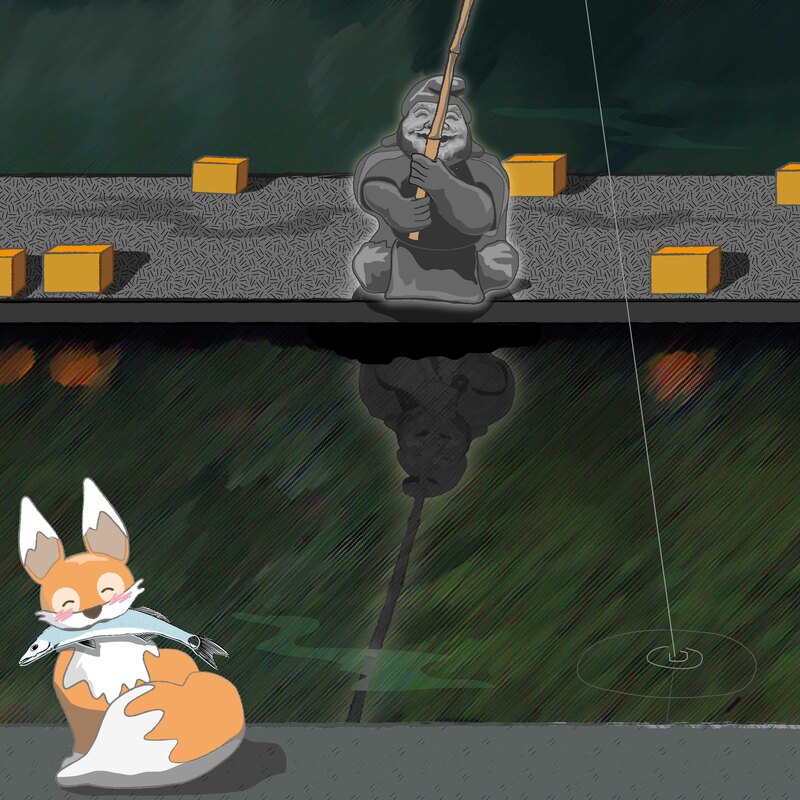 “You are really starting to get the hang of Tokyo, little one!” Kiku was very pleased, and explained that there were places known as ‘fishing centres’ right in the centre of Tokyo, where you could be guaranteed to get a bite. 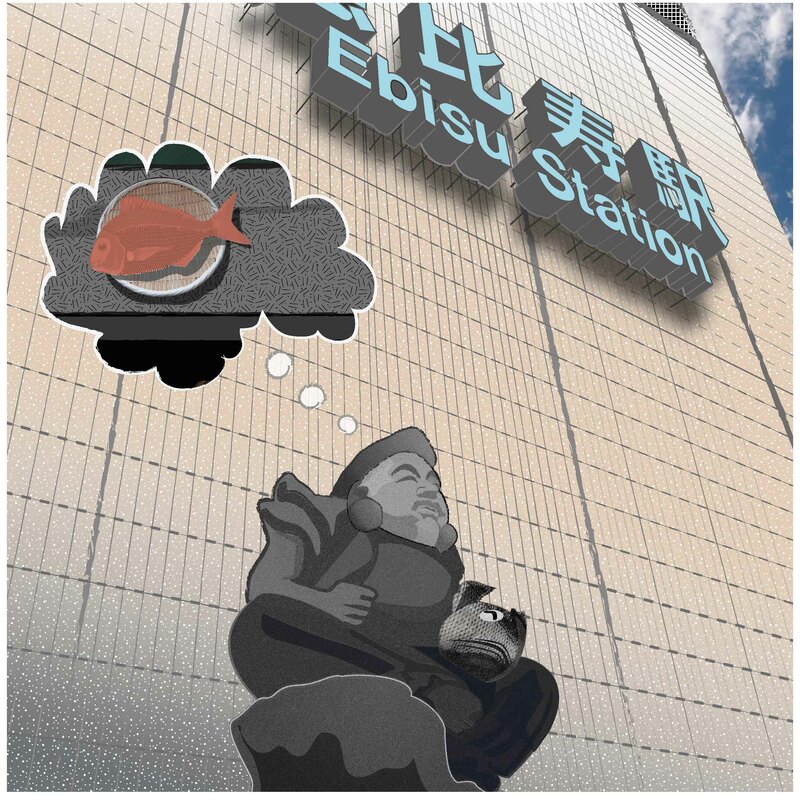 After further discussion, the group agreed that Ebisu would return to his plinth at the station, and Kiku would take him fishing later that week. The god was happy to daydream the rest of the day away thinking of the fish he would catch. 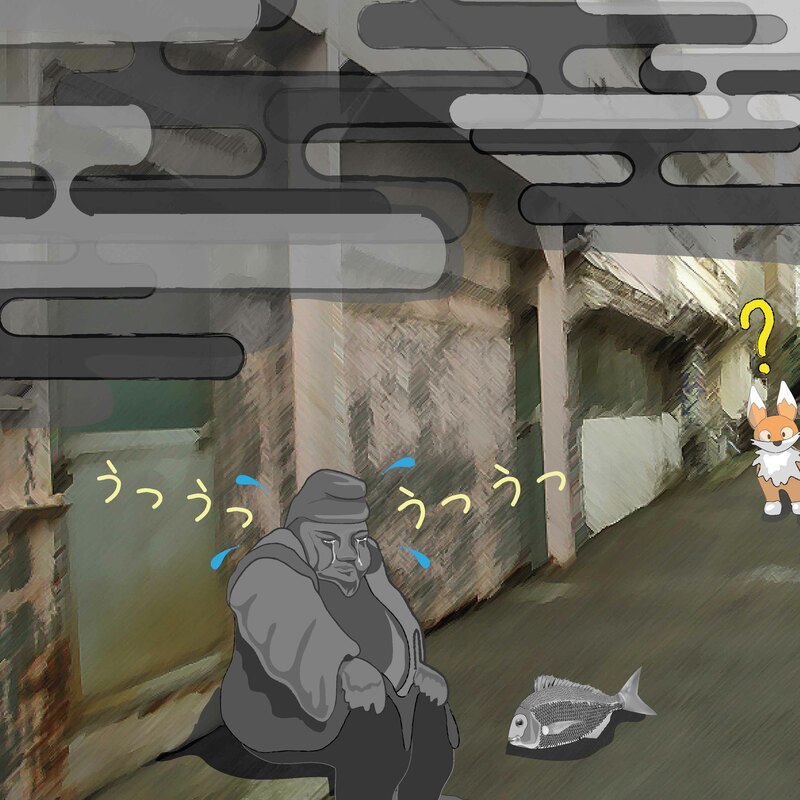 On the way back to the Bamboo Bathhouse, Miko-chan asked Boss Panda, “When Kiku-kun takes Ebisu-sama fishing, won’t people notice the statue has disappeared again?” “Good question”, said the Panda “but have no fear. 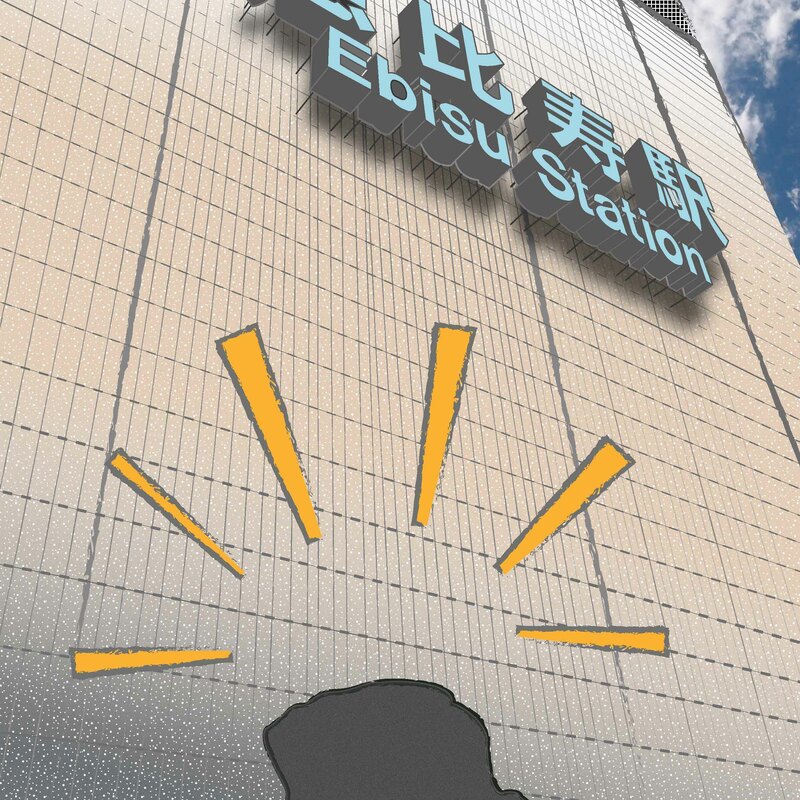 We will make sure an image of Ebisu appears in the place of the statue when he takes his break. No-one ever touches the statue, so that will be enough to prevent any suspicion”. The Ichigaya Fishing Centre (市ヶ谷フィッシュセンター) is right outside Ichigaya Station, a 10 minute journey on the Chuo-Sobu local line from Shinjuku station. The carp pond for adults costs 750 yen per hour, and there is a ‘mini-fishing’ pond with goldfish and small carp for children and for people to practice, which costs 400 yen for half an hour. The large fish are returned back to their sections after they have been weighed and been allowed to rest in a separate tank. Children can take away two goldfish if they wish. The fishing centre is open every day of the year from 9:30am to 6pm. It is believed that the gods of Japan gather at Izumo Shrine in October to discuss the coming year’s marriages, deaths, and births, and to prepare lucky amulets for the year to come. Until 1873, the tenth month of the lunar calendar largely overlapped with the modern month of November. However, after the Gregorian calendar was adopted in Japan October became generally accepted as the “godless month”. The ‘month without gods’ understanding may have come about through a twist in etymology, and may not have always been read that way. Ebisu (恵比須) is also known as Hiruko (蛭子), and because he is deaf, he does not hear the call to worship at Izumo shrine and stays where he is. Ebisu is one of the seven gods of fortune, or Shichufukujin (七福神), and the only one of the seven to have originated in Japan. He is the god of fishermen, good luck and working men, and is often paired with Daikoku, another of the seven gods of fortune. This is so charming! I am totally in love with your illustrations and story. Thank you for reading it! The information that made up this story is the reason I wanted to start the blog in the first place! I just love your way with storytelling. Wonderful tale–and illustrations! I know so little of Japanese culture so it’s extra interesting. Thank you! It is how I like to record and connect the little pieces of information I pick up together! Lovely! Thank you for this.